Caring for bearded dragons is an exciting and rewarding experience that requires not only an intense love for these genus Pogona lizards, but also an in-depth knowledge of their lifestyle needs. Plentiful water is a big necessity for bearded dragons, and misting often works well for hydrating them. It isn't uncommon for some bearded dragons to be enthusiastic water drinkers, even though they receive much of their water from their meals. It's a smart idea to provide your beardie not only with a shallow and sturdy dish of water, but also with regular mistings. If you mist your lizard's enclosure and vegetables, you might be able to promote increased hydration. Never allow your bearded dragon's living environment to get overly wet, however. You can also softly mist your bearded dragon's face and head. Continue to do so until he ceases drinking. As far as actual "misters" go, putting water in spray bottles generally works like a charm. Using misters on bearded dragons not only is effective for providing them with water, but also for making the shedding process go more smoothly. 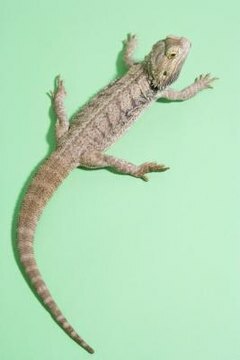 If you mist your beardie's skin during shedding, you increase the moisture in the environment -- and on his skin -- and therefore facilitate the loss of the old skin. Never, ever attempt to remove a bearded dragon's shedding skin by yourself. In doing this, you could risk harming the young skin that's in the process of emerging right below it. Note that not all bearded dragons necessarily appreciate misting. Some of them don't respond to it, while others lap the water up like there's no tomorrow. At the same time, some bearded dragons never get the hang of getting their water from bowls, and as a result prefer misting. Bearded dragons also frequently appreciate lukewarm baths in shallow water. Some bearded dragons enjoy half-hour baths once weekly, while others do so on a daily basis. It's not only important to amp up misting in times of shedding, but also in the wintertime. Remember, the air can be extremely dry during the coldest months of the year. When it's cold outside, make a point to mist your bearded dragon -- and the interior of his enclosure -- a few times per week. What Happens if a Chinchilla Gets Wet a Little Bit on Its Body?